Geneva – Findings released by IOM, the UN Migration Agency in its latest thematic Flow Monitoring Survey for the central Mediterranean route provide analysis of Nigerian migrants´ profiles and experiences while en route to Italy (direct or witnessed) with regard to human trafficking indicators in 2016 and 2017. The share of positive responses to the human trafficking indicators is higher in 2017 than in 2016 – 84 per cent and 77 per cent, respectively. Male migrants reported more frequently, instances of working without receiving expected payment (60 per cent male compared with 18 per cent female). Approximately 83.5 per cent of Nigerian migrants interviewed in 2017 reported to have suffered from physical violence during their journey. Forty-two per cent of adult female respondents declared travelling without paying, while 32 per cent did not know the total cost of their journey to Italy. Not knowing the total cost of the journey is generally associated with the difficulty of summing up the costs of bribes, ransoms, multiple transport and smuggling services, etc., while travelling for free is likely to be reported when the travel was paid by someone else or where the migrant has incurred (explicitly or not) debt to be repaid through trafficking. Overall, Nigerian migrants originate from the states of the southern part of the country: 80 per cent of all respondents were reported to have come from Edo, Delta or Lagos States. The most common route for all Nigerian migrants passes through Niger and Libya (94 per cent), while fewer migrants passed through Benin to reach Niger or through Algeria before entering Libya. Nigerian migrants reported to have travelled alone in the vast majority of cases (80 per cent in 2016 and 85 per cent in 2017), while the rest travelled with a group of non-family persons (9 per cent in 2016 and 7 per cent in 2017) or with at least one family member (11 per cent in 2016 and 8 per cent in 2017). Longer journeys and a higher number of transited countries increases migrants’ risks to multiple vulnerabilities. Migrants reported that the reasons for long stops at each transit locations (of more than five days) were due to episodes of detention or kidnapping for the purpose of obtaining a ransom, to the need of work or to the fact of having being forced to work by those organizing their transfers, mainly by pick-ups, buses or other vehicles. Meanwhile, IOM reports that 128,012 migrants and refugees entered Europe by sea in 2017 through 10 September. This compares with 293,806 arrivals across the region through 10 September 2016. 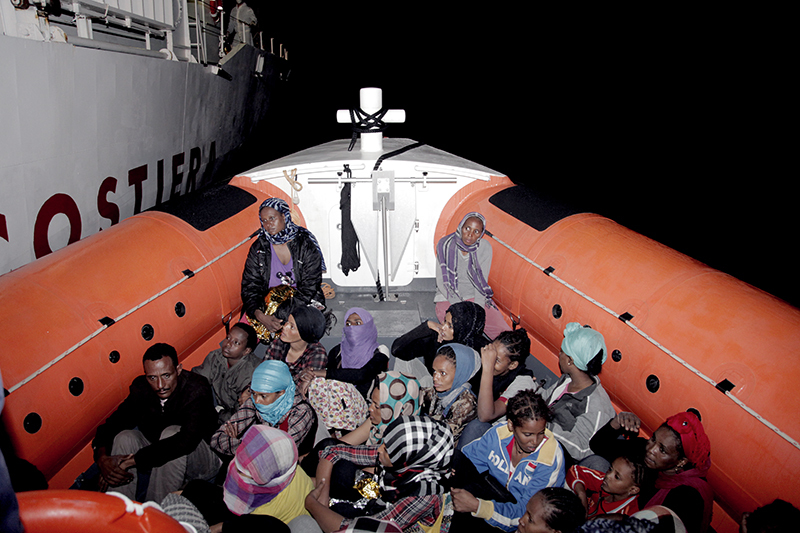 According to official figures of the Italian Ministry of Interior, 100,304 migrants arrived by sea to Italy this year: 19.53 per cent less than last year in the same period. So far in 2017, 13,826 migrants have been rescued off the Libyan coast but none in September. According to the Libyan Coast Guard, the remains of one African man was retrieved by local police on the shores of Al Khums. Worldwide, IOM’s Missing Migrants Project (MMP) reports that there have been 3,741 fatalities in 2017 through 10 September (see chart below). Since last week, MMP recorded 16 migrant deaths in North Africa and four deaths in the Americas – two migrants died after falling from a freight train in Zacatecas, Mexico, and the remains of two Mexican nationals were found in the desert in Texas. Additionally, MMP received data from Pima County, Arizona, for the month of August: the remains of 10 migrants who lost their lives crossing the US/Mexico border were recovered at different locations.